Another look into the life of DnD characters Kal and Cap’n Atka! 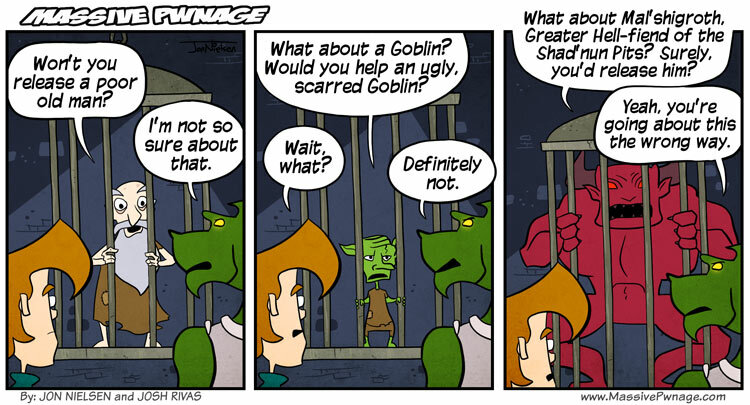 This particular comic was actually inspired by events that took place in Baldur’s Gate 2. It definitely shows its age, but Locke and I are having a good time with the multiplayer. This entry was posted on Monday, July 18th, 2011 at 12:00 am and is filed under Comics. You can follow any responses to this entry through the RSS 2.0 feed. Both comments and pings are currently closed. Eeeeee! I love Baulder’s gate!!!! But some of the NPCs are just…. Stupid. Really, really stupid. The url is still on there so it’s all right with me. Weird site.